DONATIONS ARE TAX DEDUCTIBLE. All clothing, shoes and toys donated can be claimed as charitable donations on your personal tax return. Learn More about taxable donations. Find your State to call or send us a message to find the nearest clothes recycle bin location. Contact numbers are also listed on each textile recycle bin and the name of the local charity benefiting from the collected textiles. Find a Clothing Textile Donation Bin in your neighborhood for your used clothes, toys, shoes, belts and see a list of other items. 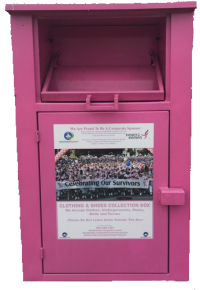 Look for our bright pink color recycling bins or our recycling depots near you or close to your neighborhood. Call or send us a message to find the nearest clothes recycle bin location. Contact numbers are listed on each textile recycle bin and the name of the local charity benefiting from the collected textiles.